The BlackBerry Q10 will launch with version 10.1 of the BlackBerry OS, weeks before its larger touch screen counterpart Z10, gets pushed the upgrade. The first point-version update since the Waterloo, Ont.-based smartphone maker unveiled its anticipated new operating system isn’t drastically different, but it does contain a number of refinements. The home screen has been improved with a reduced tool bar size and readjusted grid to fit more content. The Hub now supports PIN-to-PIN messaging and will suggest contacts while you’re typing your e-mail. With 10.1, both devices will see new features added. The camera gets an option to take photos in high-dynamic range (HDR) mode. Plus the ability to place your cursor on the screen when working with text has become more precise. Tapping the screen places a round target in the text and then it works like a directional pad. Tapping its left edge moves it one space left, tapping its right edge moves it one space right, and so on. It can also be dragged around the touch screen. BlackBerry says these changes have been made after getting feedback from users. Of course, the Q10 has some big differences over the Z10, released earlier this year. 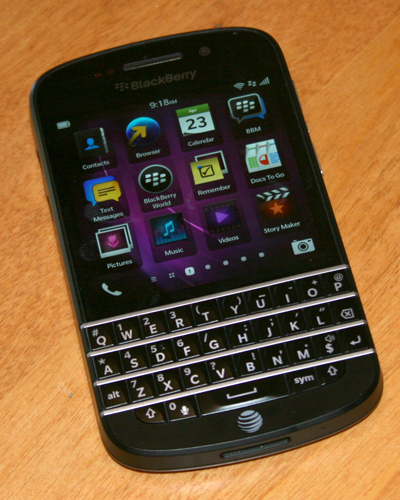 The most obvious being the physical QWERTY keyboard, a trademark of BlackBerry devices such as the Curve and the Bold. As a result, there are some different ways available to navigate the OS and trigger apps. One way is to just start typing what you want to do. For example, from the home screen you could type “email Bob” to quickly compose a new message to that contact. Or you could type the name of an app that you want to open. In this way, BlackBerry has combined universal search with a new command capability. 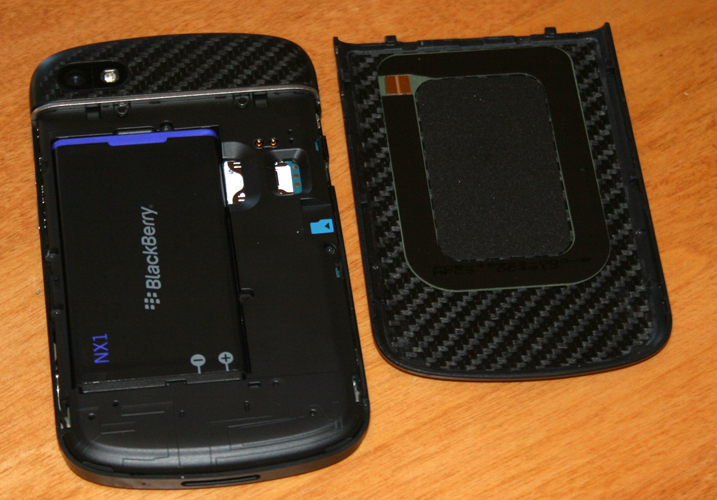 The smaller screen on the Q10 is also an OLED screen, not the LCD display found on the Z10. 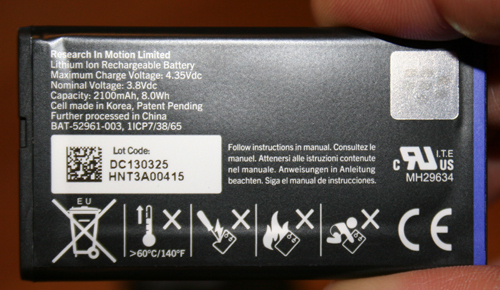 BlackBerry is using this, combined with a larger battery (2100 mAH vs. 1800 mAH on the Z10) and more black screen space used in apps such as Calendar and Settings with the effect of conserving energy. The changes add up to an extra three hours of talk time promised in the spec sheet, at 13 hours for the Q10 compared to 10 hours for the Z10. Keyboard short cuts are back with the Q10. Jump to the top of your messages in the hub by pressing “T” and to the bottom by pressing “B”. When you have a message open, you can press “F” to forward it and “R” to quickly compose a reply. Many BlackBerry fans will appreciate the return of these short cuts, but not all of the old tricks from former QWERTY BlackBerry devices are back. For example, the speed dial feature is gone. It used to be a long press could be used to dial a number or launch an app. But that capability isn’t supported by BlackBerry 10. Still, there is plenty of nostalgia for longtime BlackBerry users here. 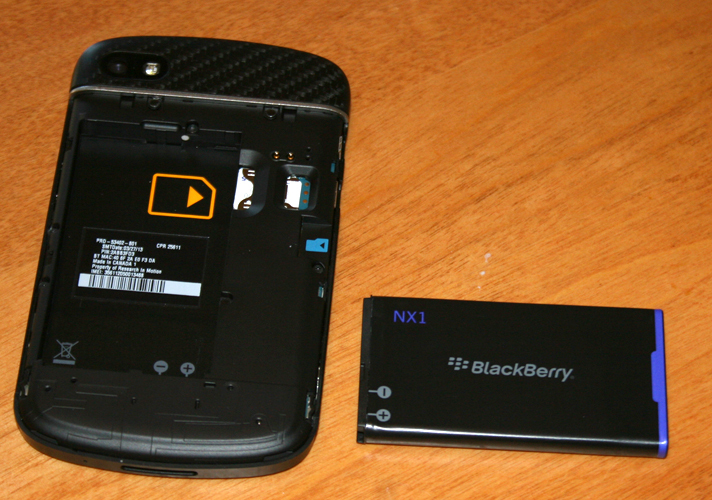 The Q10 takes up about the same footprint as the Bold 9900. The design is very similar and the keys are raised in the same way. But the screen on the Q10 is much bigger. This was done by sacrificing the track pad and having straight rows of keys instead of a curved arrangement. The new predictive text feature in BlackBerry 10 is also found on board the Q10. The suggested words appear three at a time along the bottom of the touch screen. Tapping them will input the full word for you. Pro typists who find this gets in the way can turn it off in the settings. Although the Q10 may seem more suited for getting work done, it can do everything the Z10 does. It even comes preloaded with Need For Speed, which you play by tilting you device back and forth to steer your car. While the Q10 has a 3.1-inch screen as opposed to the 4.2-inch display of the Z10, and offers a square 720 by 720 pixel resolution instead of 1280 x 768, the apps found in BlackBerry World that typically run on a touch screen seem to work fine in the constrained screen real estate. Overall the BlackBerry Q10 does a good job of balancing the traditional look and feel that long-time BlackBerry fans will appreciate and still offering enough new features and capability to have new users considering the device. In terms of smartphones with a physical keyboard, the Q10 is in a class of its own. 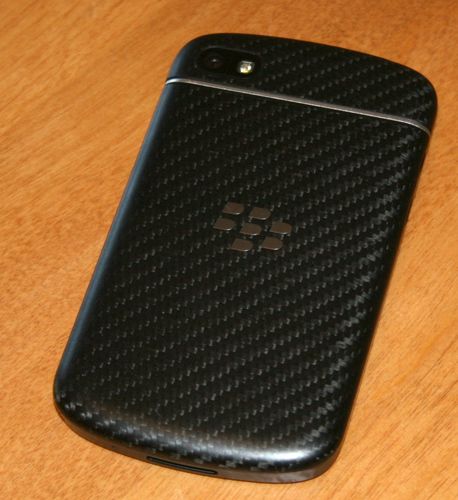 The Q10 is available for pre-orders at multiple carriers in Canada. It will be available May 1 from Rogers Wireless, Bell Mobility and Telus for $199 on a three-year contract or $700 off contract.